Pakistan today promised not to raise the Kashmir issue at next week’s SAARC summit here and offered to remain “constructive and supportive” on issues relating to terrorism. 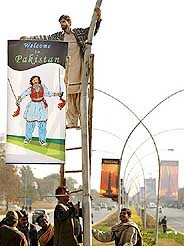 Workers hang banners in Pakistan’s capital Islamabad on Monday in preparation for the upcoming SAARC summit to be held from January 4-6. Do you feel that it has been a year of success for India, diplomatically? Toeing DMK’s line, the MDMK today decided to pull out of the National Democratic Alliance and withdraw its two ministers from the Union Government. The Special Investigating Team probing the fake stamp paper racket masterminded by Abdul Karim Telgi, on Monday filed chargesheets against nine persons, including an MLA from Andhra Pradesh, for their role in the scam. Demanding the resignation of Punjab Chief Minister Amarinder Singh on “moral grounds”, the Shiromani Akali Dal and the BJP today sought a CBI probe into the purported “hawala transactions” allegedly involving his son Ranainder Singh. The Congress appears to be doing a tightrope walk on the contentious issue of who will lead the broad national alliance of secular parties. India will rush three planeloads of relief material for the quake-hit Iranians. 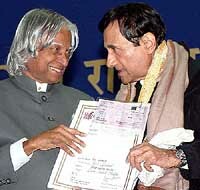 Evergreen hero Dev Anand was clearly the star of the evening. As he walked up the podium at the Vigyan Bhavan today to receive the Dadasaheb Phalke award.